“2 Timers” Opens like a Flecktones tune, but soon blossoms out into a more frenetic soup of lickety-split melodies, extensive Q and A between instruments, catchy melodies and great grooves, and avant-garde atonal group improv – I love the half-time-feel break in the middle, a characteristically abrupt dynamic shift. “Cambo” centers on a slapped and popped bass groove against effects-soaked chorus chanting and Joseph Wooten’s mellow 1970s R&B-style keyboard chords (but check out his brilliant runs later in the tune – they sound like rain; captivating and yet unobtrusive at the same time). 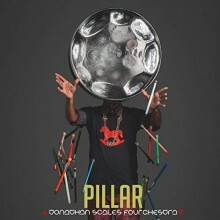 “I Saw God” is modeled on West African popular styles (Palm Wine in particular) with densely layered guitar melodies, bouncy, get-up-and-dance rhythms, and falsetto unison chorus vocals (featuring Richard Bona) that alternate with Wooten’s mostly spoken-word tale of an encounter with God. “The Lesson” is almost entirely bass-driven, featuring a low-key melody backed with bass arpeggios and chords (the liner notes make sure to mention that Wooten did this with “no overdubs”) and backed with spare percussion (relative to the rest of the album). 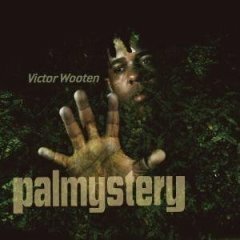 Wooten throws in some interesting tremolo and flamenco-like rasgueado articulations to punch things up. “Left, Right, & Center,” with its funk-jazz fusion feel, features three astonishing drummers – JD Blair, Dennis Chambers (a former member of Parliament/Funkadelic and longtime drummer for John Scofield), and Will Kennedy! Wooten liked Mike Stern’s guitar solo on this tune so much, he decided to learn and double it, and Neal Evans backs up on Hammond B-3 organ. “Sifu” opens with lush keyboard chords and sampled voice (Sifu Brian Edwards, with whom Wooten studied Wing Chun Kung Fu) – the whole tune has a swirly, sort of new-agey feel at the beginning which evolves into a groove, with Regi Wooten handling the rhythm bass work beneath Wooten’s blistering solos. “Miss U” featuring The Lee Boys (a funk/gospel band out of Miami, FL) is a finely mixed musical gumbo: here a rock-guitar driven R&B feel backs up The Lee Boys’ gospel-inflected harmonies. Roosevelt “The Doctor” Collier’s pedal steel guitar, Alvin Lee’s electric, Wooten’s slide bass and Alvin “Lil’ Al” Cordy’s standard bass underpinning all add spice, depth, and nuance. “Flex” opens with an infectious Wooten popping rhythm (played here on tenor bass). Joseph Wooten’s brilliant keyboards really shine on this tune – laid back rhythms and cascading sheet-runs (what Coltrane might have sounded like if he played keys). Check out Regi Wooten’s achingly atonal, funky, chord-driven guitar solo. Anthony “Flex” Wellington offers the thumb solo on bass. In “The Gospel,” the whole Wooten family comes together around Wooten’s mother’s rendition of an old Southern Baptist hymn (recorded over the telephone) forming the base of the piece. In addition to Joseph Wooten on keyboards, Victor Wooten’s aunts and uncles sing along and some of the younger kids on the family sing on the second section. “Song for My Father” opens with a characteristically squirmy and bombastic unison riff into a steady jazz-funk groove, complemented nicely by Regi Wooten’s treble-voiced rhythm guitar playing and features a great collection of solos: a wonderfully bluesy tenor sax solo by Karl Denson, fiery soulful work by Dane Bryant on keyboards, and Steve Bailey’s snakey fretless solo. “Happy Song,” is, as you might guess, an upbeat R&B flavored instrumental with catchy riffs and grooves highlighting harmonized bass and guitar melodies. “Us 2,” which closes Palmystery, is my personal favorite. Wooten’s slide bass and Keb’ Mo’s slide guitar perfectly complement one another as together they deliver a slow, contemplative tune. Here we are listening to an intense musical conversation between Wooten and Keb’ Mo,’ with moments of gentle, sympathetic back and forth and others of effortless synchronicity. Palmystery is a musical journey into sheer talent, collaboration, and artistry. Make sure to follow up with some of the players that appear on the album, too, because Wooten allies himself with the best. A new work of fiction written by Wooten that explores his musical philosophy. The Music Lesson and Palmystery were both released simultaneously, and are designed to complement one another. An annual event founded by Wooten. It features Wooten himself as well as a number of other incredibly talented bass instructors, and is designed to explore the link between nature and music-making.